RTF stands for rich text format. It is a human-readable document file format. Rtf was first introduced by Microsoft in 1987 and since then has been continually developed. Since RTF is supported natively by the Microsoft Windows operating system it has become widely used. Due to the same fact developers have no problems with targeting this platform to integrate RTF display and editing capabilities into their applications. The RTF format is the default rich text format for Mac OS X's default editor TextEdit. The open-source editor AbiWord, which is common on Unix-like platforms that implement the X Window System and GTK, can also edit RTF files. 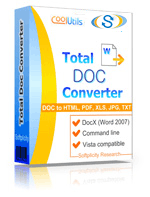 If you want to convert RTF to other formats like PDF, HTML, TXT, TIFF we recoemmenr using Total Doc Converter. It's a reliable tool to convert any documents (Doc, DocX, DocM, RTF, TXT) and preserve the original document's layout.